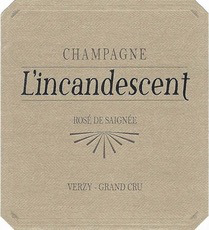 Sparkling Mouzon-Leroux Champagne Grand Cru Extra Brut L’Incandescent Rose de Saignee - Royal Wine Merchants - Happy to Offer! These are some of the most exciting wines we’ve tasted in a very long time – pure expressions of Verzy Grand Cru, one of the most interesting and diverse terroirs in the Montagne de Reims. Sébastien Mouzon is producing certified organic wines and practicing biodynamic viticulture. 100% Rose Method de Saignee.